Patna Pirates came back from the dead to tie their match at 41-41 with Haryana Steelers in an inter-zone clash in the Pro Kabaddi League (PKL) on Friday. Pardeep Narwal, who had a disappointing first half, ended up scoring 13 points as Haryana blew their first half advantage. Wazir Singh scored 12 points for Haryana. Patna are second in Zone B after 10 matches with 36 points whereas Haryana moved to second spot in Zone A with 41 points from 10 matches. Haryana started strongly, inflicting an all out on the visitors in the 11th minute to lead 15-7. Surender Nada and Mohit Chhilar were rock solid at the back as they didn't let Patna score too many raid points. Pardeep could muster just one bonus point in the entire half. Surjeet Singh and Wazir Singh combined to score 11 points in the first half as Haryana Steelers led 22-12 at the break. Monu Goyat had six points for Patna in the first half. Haryana Steelers began the second half in style as they forced an all out in the 21st minute to lead 26-14. Pardeep finally made a successful raid in the 23rd minute as Patna trailed 15-28. With his team looking down in the dumps, Pardeep came up with a super raid in the 29th minute as Patna trailed 21-32. Pardeep scored another raid point as Patna Pirates inflicted an all out in the 30th minute to trail 26-32. 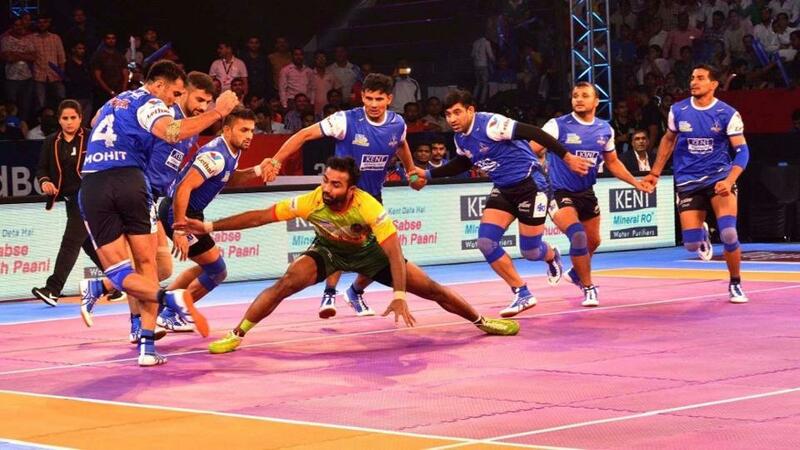 Haryana were looking shaky as Patna Pirates mounted a comeback. With less than five minutes to go, Patna trailed by five points. In the 36th minute, Patna Pirates cut the lead to just two points as they trailed 34-36 after Monu Goyat made a super raid. Patna then inflicted an all out in the 37th minute to lead 38-37. Wazir bagged two raid points in a minute as Haryana Steelers tied the match at 39-39 in the 38th minute. It was all square in the last minute with both teams tied at 41-41.